To prepare the tenderloin: Using a sharp knife, make an approximately 1/4-inch deep slit down the length of the tenderloin(s), from one end to the other. In a small bowl, mix the garlic with the sage, salt, pepper and 4 tablespoons of the olive oil. And spread this seasoning paste all over the meat, including inside of the slit. Heat a large, ovenproof casserole or a deep, 12-inch skillet over medium-high heat. Add the remaining 2 tablespoons of olive oil. Once hot, add the tenderloin and brown on all sides, about 6 minutes total. If you used a skillet to brown the meat, transfer it to an ovenproof casserole or baking dish. Add 3 cups of water and place in the oven. Roast for 30 minutes, or until the meat is cooked through and the internal temperature reads 150 to 160 degrees Fahrenheit. Remove from the oven. When cool enough to handle, place the meat on a chopping board and cover with aluminum foil to keep warm. Pour the meat juices into a measuring cup and set aside. To make the mole verde: Place the tomatillos, garlic and chiles in a medium saucepan, cover with water and bring to a simmer over medium-high heat. Simmer for 10 to 12 minutes, until the ingredients are completely cooked through and soft, and the color of the tomatillos has changed from light or bright green to olive. Meanwhile, heat a small skillet over medium-low heat. Add the pumpkin seeds and toast, stirring often, until you hear popping sounds, like popcorn, and they begin to brown lightly, about 3 to 4 minutes. Take care not to burn them. Immediately transfer to a bowl or plate and set aside. Drain the tomatillos, garlic and chiles and place in a blender (add only one chile at first). Add the salt and puree until smooth. Then add the toasted pumpkin seeds, onion, lettuce, cilantro and parsley to the blender and puree until completely smooth. Taste and blend in the second chile if desired. Heat the canola or safflower oil in a casserole or heavy soup pot over medium heat. When the oil is hot, add the puree and stir well, being careful as this sauce really likes to jump around; use your lid as a shield. Stir in 1 1/2 cups of the meat juices (or broth or water) and bring to a simmer, cover partially and simmer for 15 to 20 minutes. Stir every 4 to 5 minutes, to prevent the sauce from sticking to the bottom. If the sauce appears to be cooking too fast and sticking, reduce the heat to low and continue to simmer until very thick. It should coat the back of a wooden spoon heavily. Taste and adjust salt. Turn off heat and keep covered. 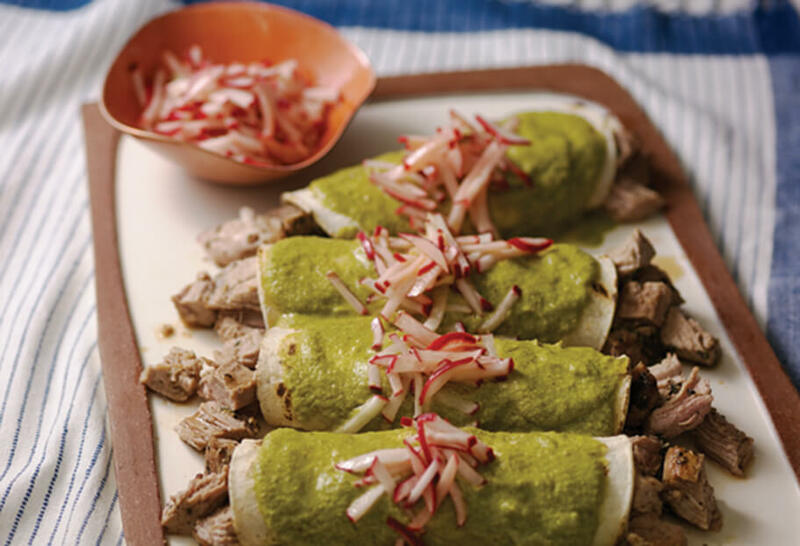 To assemble the enchiladas: Slice and dice, or coarsely chop, the cooked pork tenderloin. If the meat is cold, you may place it back in the casserole after you dice it with any remaining meat juices and heat through over low heat. Prepare the tortillas for the enchiladas, either heating them on an already heated comal or skillet set over medium heat, or “passing" them through hot oil. If necessary, reheat the mole verde. One by one, dip a tortilla into the mole verde and place on a plate or chopping board. Place about 1/4 cup of diced meat in the middle and roll into a chubby enchilada. Then place it seam side down on a serving platter. Continue with the rest of the tortillas. Pour the remaining mole verde on top. Garnish with the radish pico and serve. We had this with friends and it was fabulous. We will be making it again. We were wondering why we add the three lettuce leaves to the Mole? What does it do for the recipe? Thanks for sharing your great recipes with us. It adds to the color and flavor. And I’m so glad you enjoyed it, Becky! I’ve been trying to print a few recipes and getting an error message. Maybe there is a problem with the links on your website? Thanks. This mole verde is fabulous. I don’t eat meat, so I made the mole , poached shrimp in it, and served it over rice. FABULOUS. Jeff, I’m so glad you loved the sauce! I would like to get your tamales that you made on your show this afternoon . I’m certainly going to make this pork tenderloin enchiladas as well as your chicken enchiladas . And thank you for your carnitas recipe too . Hola Paty!! Me puse a preparar la receta de las enchiladas y a mi familia les encanto, tenia un poco de duda porque el lomo es una carne un poco seca, pero en esta receta quedo delicisioso!! Hi Pati! Just saw the show this morning so excited to make these and the gaspacho for my friends dinner tonight! Thank you for the insparation. Nicole I hope you and your friends love it! Pati quiero agradecerle por esta receta! La acabo de hacer y me encanto! Nomas le heche un poco mas de chile serrano para que estuviera mas picosita la salsa. Can you provide me a link to a video showing you tying your meat? I haven’t heard of this exact technique before and it sounds much easier than the way I’m doing it. I don’t have a video up of that yet…I will try to post one soon. I just made your Mole Verde sauce. I will be making chicken enchiladas tomorrow night and since I had no pork in the house, I thought it would be great with chicken… Trying to get a jump on my Sunday dinner while the boys are out of the house; don’t worry, they always help with the prep and cooking tomorrow!! Thank you for sharing your lovely recipes and family with us. You are a joy! Thank YOU Shelly. I hope you and your boys enjoyed your Sunday dinner! Pati, do you cover the pork while it is roasting in the oven? Making it right now. Smells fantastic. Glenda, I recommend you use a casserole or baking dish to roast it. Hope you enjoy! So glad to hear they were a success Miguel! Hi Catheleen, You can prep the tortillas either way…heating them on an already heated comal…or “passing” them through hot oil. There are so many great side dishes that would go with these enchiladas…any rice or veggie…pick your favorite! First, I have to say thank you very much, muchas gracias, merci beaucoup for mentioning heating the tortillas in a hot pan (or comal) before filling and rolling! l have been making enchiladas for years, and never found the most effective method for warming the tortillas. My mother-in-law said dredge them in warm oil, but I didn’t like the oiliness. I saw a street vendor dredging her tortillas in the sauce, but no matter how fast I worked, they got soggy, and the enchiladas stuck together when I scooped them from the dish. I used your hot pan method tonight, and they did not stick, they did not split, and they had the nice lightly chewy texture of a fresh corn tortilla. I am so happy you shared that tip! Second, we LOVED the pork. I too served them like tacos, and the sauce with the sage flavor of the pork was wonderful. I had a lot of sauce leftover, so I reheated it with some pan drippings from a baked chicken & some jalapeño pepper sauce and used it to make chicken enchiladas with Monterey Jack cheese. They were a hit! As I made them, I also thought how the parsley flavor would also go well with seafood enchiladas, so I plan to try that next time. Fantastic Pati!! Wow!! I will cook my pork loins like this every time. I’ve never browned it before baking and man does it ever make a difference. The sage really makes it! We ate these like Mexican tacos with Monterey Jack cheese topped with the mole sauce and fresh lime juice on each one. Absolutely fantastic!! So glad I tried this recipe. You make it look so easy and I wasn’t sure I could do it, but I did!! It was a huge hit! Thanks for sharing the recipe ? Heather, I’m so happy you tried them and liked them! I notice that you don’t bake your enchiladas after preparing them. Is this a culinary choice on your part, or is it a more traditional method? Could I prep the enchiladas, bake them a bit (maybe with some queso fresco) and then eat? Would it make the enchiladas a little more sturdy, or no? Thanks for your great recipes and whatever help you can offer. I’m excited to try these! Also, I’m cooking this tonight for dinner. What side would you serve with this? So many choices! Rice, beans or potatoes work lovely.